RPSC RAS Pre Exam Marks Check Here. RPSC RAS Extended 2018 Result Check Here. RPSC RAS/ RTS 2018 Additional Result Check Here. RPSC RAS/RTS 2018 Result Check Here. RPSC RAS/RTS Answer Key 2018. RPSC RAS New Exam Dates Notice Check Here. RPSC RAS/RTS Mains Exam Postponed Notice Check Here. RPSC RAS/RTS Mains Exam Notice 2018 Check Here. RPSC RAS/RTS Admit Card 2018. RPSC Notification is out. RPSC is recruiting for 980 RAS Post 2019 Pre Marks Posts. 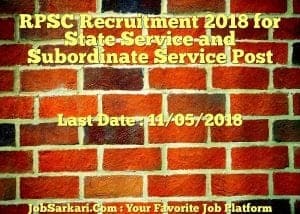 You can check RPSC - Rajasthan Public Service Commission last date, download RPSC notification, visit RPSC official website and check other RPSC Vacancy details.Complete Vacancy and recruitment Details about 980 RAS Post 2019 Pre Marks vacancies in RPSC are provided below by JobSarkari.Com only for you. Last Date for Correection 18/05/2018. SC / ST / PH Rs.50/-. Mode of Payment The application fee can be submitted through online mode by using credit card or debit card or net banking or through challan or through E Mitra Kiosk. Rajasthan State Insurance Service 11. Rajasthan food and Ration Srvice 01. Rajasthan Child and Women Development 77. Total No. of State Service Post 405. Rajasthan Industrial Subordinate Service 05. Rajasthan food and Citizen Rasad Service 35. Rajasthan Child and Women Development 03. Total No, of Subordinate Posts 575. Candidate Must Have Passed Bachelor Degree in Any Stream. Age Limit as on 01/01/2019. Age Relaxation Upper Age Limit is Relaxable by 05 Years for SC / ST / OC / OBC / female of Rajasthan and 10 Years for PH Candidate. 7. Online Application can be Submitted on or before 11th May 2018. Q. What is the Last Date For RPSC RAS Post 2019 Pre Marks Vacancy ? A. Last Date for RPSC RAS Post 2019 Pre Marks Posts is 11/05/2018. Q. 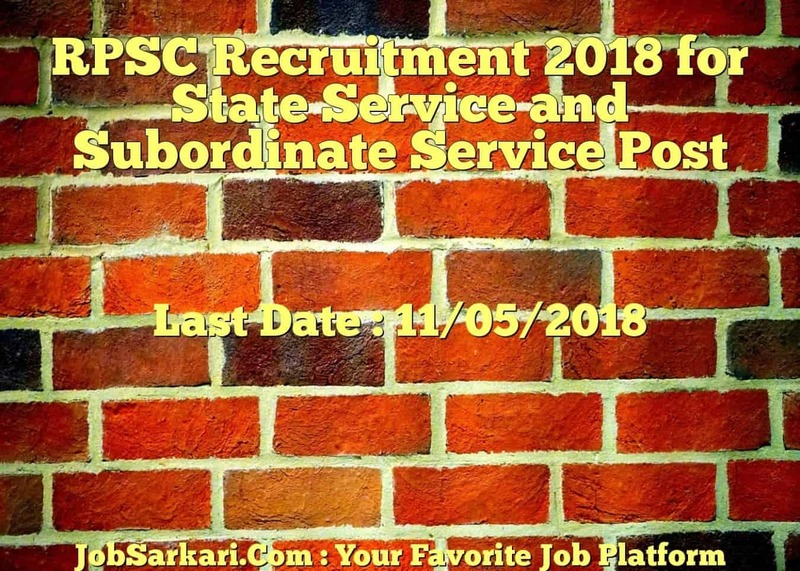 What is the Form Type of RPSC RAS Post 2019 Pre Marks Recruitment ? A. The Form Type for RPSC RAS Post 2019 Pre Marks Posts is Online. Q. How many vacancies are available in Rajasthan Public Service Commission RAS Post 2019 Pre Marks Posts ? A. There are about 980 Vacancies in Rajasthan Public Service Commission RAS Post 2019 Pre Marks Posts. Q. What is the Full Form of RPSC ? A. Full Form of RPSC is Rajasthan Public Service Commission .